TYPE : 1 Bedroom 1 Bathroom. NEARBY : CENTRAL RAMA 9, MRT RAMA 9, FORTUNE TOWN Bldg., G TOWER Bldg. The unit is about 3 mins walk to MRT Rama 9 station which is just directly below Central Plaza shopping mall. Newly building with swimming pool and gym at the 8th floor. It comes with a sofa, washing machine, strong Wifi, smart TV and cable channels, kitchen utensils, hot water shower and refrigerator. It\'s in the centre of everywhere in Bangkok. MRT is just 3 mins by foot. 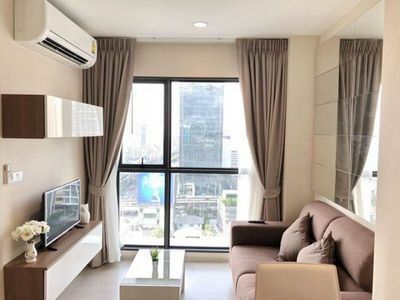 Rental Price : 20,000 Baht / Month.